Technical Analysis and Elliott Wave Theory: Elliott Wave Update 29 December 2009 ~ 7 gap ups in a row! Elliott Wave Update 29 December 2009 ~ 7 gap ups in a row! SPX: The market gapped up (yes, again!) and began its common correction shortly after the open. Then, it just went sideways for the rest of the day an sold off into the close. The morning rally completed submicro wave (1). After that wave (2) started and lasted for the rest of the day. So far, everything fits in with my count. However, I expected wave (3) to begin today and that obviously wasn't the case. 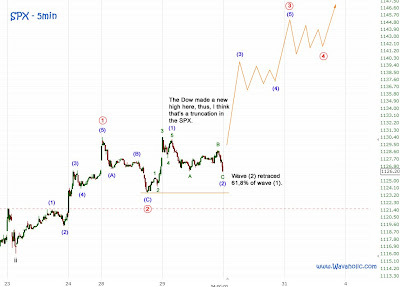 Thus, first doubts came up whether my pretty bullish count is correct. We'll see... If the market should drop below 1123,5 tomorrow I'm gonna post another (less bullish : )) count. But also then I expect at least one more high over the next few days. Enjoy the last days in 09!